2. Sherridan Atkinson from Purdue to Galatasaray (Turkey). American MB Jackson is also on that team. 3. Nia Kai Reed from PSU to Halkbank (Turkey). I always love to see NCAA graduates moving forward to play pro volleyball, especially the promising youngsters. Please also add your information here if I miss anyone. "There is no dark side of the moon, really. It's all dark." Jerry, the Irish Doorman. I heard that the polish team did not sign her because they are not content with her defence. Good luck to all! Great news thank you! 1. 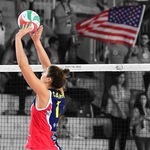 Jordyn Poulter from UIUC to Chieri (Italy). That makes it a swap. Poulter goes from Illinois to an Italian pro team. Vrankovich goes from an Italian pro team to Illinois. Don't know about her earnings but judging from the stats you can dig out on the Italian League site, Vrankovic was a "practice player" with near zero court time for the 1st division club Bolzano and a sub with limited court time for the 2nd division club Palmi. From what I understand this is an upgrade for Nia. She really likes the team, the level of play is so much stronger, the location AND she just played against Simone Lee's team yesterday and will play Jordan Larson's team soon. Being overseas, especially in your first years, its really nice to see friendly faces from time to time. Pro teams might have an issue with her level of athleticism and blocking. At the next level everybody will be bigger and better and she wont have the embarrassment of riches that she had at Minn.
Don't get me wrong, I loved her as a college player but it doesn't always translate.